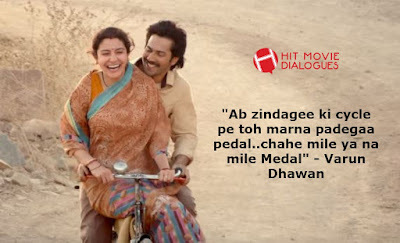 Sui Dhaaga Movie Dialogues - Get all the famous dialogues from Sui Dhaaga movie. This is a comedy-drama film directed by Sharat Katariya and produced by Maneesh Sharma under the banner of Yash Raj Films. Varun Dhawan, Anushka Sharma is playing the main lead role. The film promotes the Made in India campaign who is operated by Indian Government. Varun Dhawan is portraying the character of a tailor and Anushka Sharma playing the role of embroider. This is an awesome film and heartwarming story of pride and self-reliance. The trailer has already released. Both are looking awesome in the new avatar. The film has also some emotional and funny dialogues, which are delivered by Varun Dhawan, Anushka Sharma, and other actors. Here We have collected all the best dialogues of Sui Dhaaga. "Roz doggy banate hain kya..Aapko...pagal ho kya..roz kaun doggy banegaa"
"Are iske kam chalne ke intezaar mein....Amma...Babuji chal basegen...phir yahin baith kar kafan seelta rahiyo"